One of the big questions people are going to ask is how, exactly, meth is being distributed? How, where and when, is it being sold? Well, a transaction could be done right in front of your eyes and if you didn't know what you were looking for, you'd never even notice. Drug dealers have been known to be a highly creative and ingenious bunch. Tricks learned from a lifetime spent on the dark fringe of civil society. It's not always sold out of a central location. Although it is often being sold out of homes. People coming and going at all hours of the day or night, is often a telltale sign. 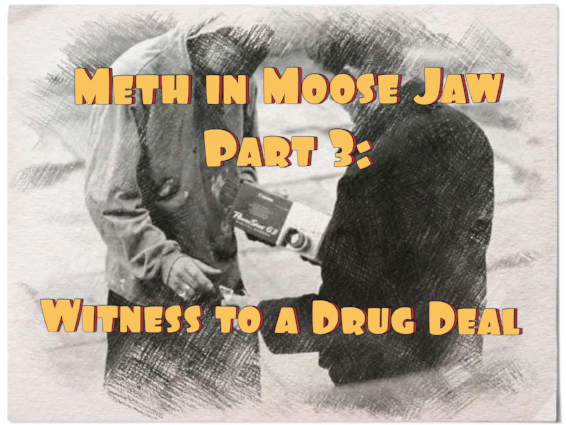 That was exactly what tipped off the Moose Jaw Police Services (MJPS) last summer; when they raided a South Hill home and arrested four individuals under allegations that they were trafficking in meth. Meth sales can also be highly mobile and involve multiple sellers in multiple locations. Sellers can be in one place for a short while, then quickly move to another location. First off, the dealer will find a place to stash a larger supply, or he will have an accomplice do it for him. Sometimes they will employ a vehicle and have a friend bring them even more supply. The key thing for them is to not have a large quantity of meth, or other narcotics, in their possession. That way, if they're arrested, they do not have a large enough quantity of meth on them to be charged with "Possession For The Purpose of Trafficking", which comes with a much harsher penalty. Being caught with a small amount of any illegal narcotic comes with a possession charge, and the person dealing it might get away with a simple fine, or a quick stint in rehab, but a trafficking charge likely means jail time. This is what they will do. They will enter a public establishment, then go to the washroom. Then, they will find a seat where they can watch whoever is going in and out of the washroom. At that point, they will either send or receive a text message, often through Facebook Messenger. Moments later, someone else will enter the facility and go directly to the washroom. Upon their exit, the first individual get up from their seat and go into the washroom, before returning to their seat and repeating the process over again. How do I know this is happening? Could it all be a coincidence? Am I assuming something? Well I actually witnessed it. I managed to get into the washroom before the suspected dealer did and, hidden in the baby change table, I found $40. I left it there. I walked out of the washroom where the suspected dealer was hanging out, texting, he looked angry and anxious. All I said to him was, "sorry buddy, when you gotta go, you gotta go.” After he entered and exited the washroom he looked relieved, and then he left the public facility. I re-entered the washroom and checked the baby change table and the $40 was gone. About 7 minutes later, the same guy was back. He kept it up for three hours, with a total of 10 people coming and going out of that washroom. I saw this happen over three consecutive nights and beat him into the washroom a couple of more times, and each time there was money hidden in the baby change table. When I checked again after he left, the money was always gone. I witnessed 12 different individuals, whom I feel safe in assuming are users of crystal meth and cocaine, enter and leave that washroom over those three nights. I recognized four of the customers as chronic meth users. I didn't go back to that public establishment for a couple of weeks, and when I returned, I asked an employee I was friendly with about what had happened to “my buddy”? The employee told me he had told the suspected meth dealer he knew what the guy was up to and he wasn't going to “be selling any of that crap here” or he was “calling the police.” The alleged dealer asked the employee if he wanted to “do some lines?”, a reference to cocaine. At which point the employee told the alleged dealer to get out and don't come back. The alleged dealer left with two guys in a car with a noisy muffler. From all reports, the suspected dealer never returned. On their Twitter account, MJPS tweeted out a photo of a large bag full of individual packages of meth and cocaine. They were poking fun at the drugs' hapless owner. I recently spoke with someone I met while doing these stories, this person uses meth sporadically. They told me all about dealers stashing their product, so as not to have a large amount on them, if arrested. My acquaintance then laughed about this dealers apparent misfortune, bragging that he likely knew the guy. Public washrooms have also been used to stash drugs and weapons. If the washroom has a suspended ceiling, dealers will often stand on the toilet seat and lift the ceiling tile and then stash things in there. If you see ceiling dust on the floor or ceiling tiles askew, it's possible people are using that bathroom to stash product. Another tool they use is the garbage can. They lift out the garbage bag and then place the contraband underneath it. Now, just how widespread is the use of public washrooms for distributing narcotics? Sorry, I cannot say. But it is just one way meth and weapons are being secreted away by users and dealers. I am not going to tell you what establishment I saw this occur in, but I have noticed the telltale signs in other easily accessible public washrooms. But if the serious/violent crime statistics are any indicators and meth is, as I believe, a major factor, then shutting down some of the sales venues might just help slow it's spread. By posting this, I hope to make business owners aware of the way in which public washrooms are occasionally used. I hope this can be used as a tool in preventing the further spread of destructive drugs.